Tags: Antique Map, Indonesia, Maluku, Moluccas. Antique Map of the Moluccas by Plancius titled ‘Insulae Moluccae celeberrimae (…)’. Engraved by Petrus Plancius, the great Dutch engraver and first Hydrographer to the Dutch East India Company (VOC), and compiled from the latest and highly secret Portuguese sources, the map provides the most detailed cartographic knowledge of the region at the end of the 16th century that was collected by Huygen van Linschoten, the young Dutch secretary to the Portuguese Archbishop of Goa. 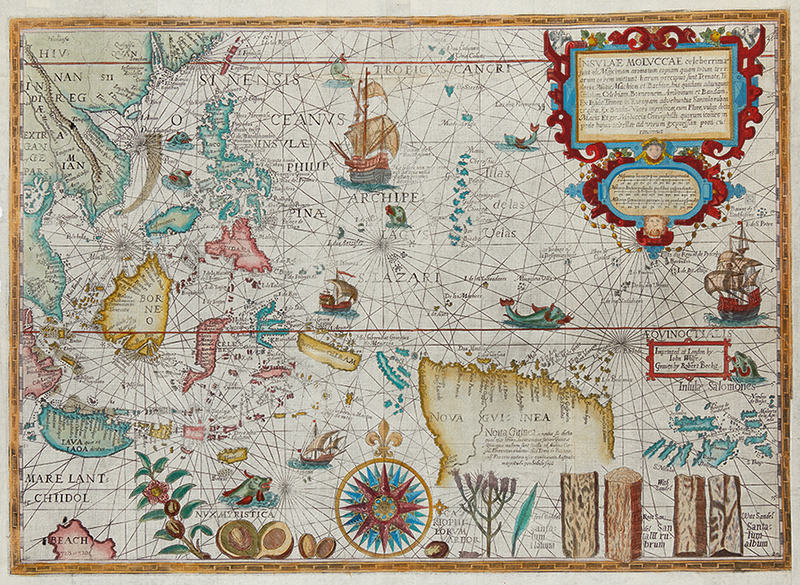 The map was originally bound into some editions of his seminal work, the Itinerario, especially the English edition of 1598, the first popular sailing guide to the ports and cities of the Portuguese trading empire in the Far East including the Spice Islands, China and Japan. The information portrayed in the map, that could bring the death penalty in Portugal if made public at the end of the 16th century. In addition to being the rarest, most valuable and sought-after printed map of the region, it is also one of the rarest printed maps of any region in the world with only an estimated total of 20 copies surviving into the 21st century, half of which are kept in museums and national libraries such as the Bodleian Library and the British Library, with the remainder scattered among private collections, including one copy at Bartele Gallery.